How to delete Email Alerts? I connected my dropbox to the 'send to dropbox' template and that works very good. However, the files I upload I also get as an e-mail attachment in my email inbox. Is it possible using the dropbox only, without the attachments to my email? Hello Hans, Thanks for posting your inquiry here on the forum. Yes this can be done directly from the Form Builder. You need to delete the Notification templates that you have. 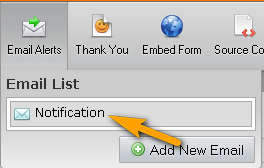 By default, when you create new forms, it will always have 1 Notification template precreated. 1. From the Form Builder, click "Setup & Embed" tab. 4. You should be able to see "Delete Email" button at the bottom left of the "Notification window"
If you need further assistance, please do not hesitate to ask or kindly open a new thread for any new topic.